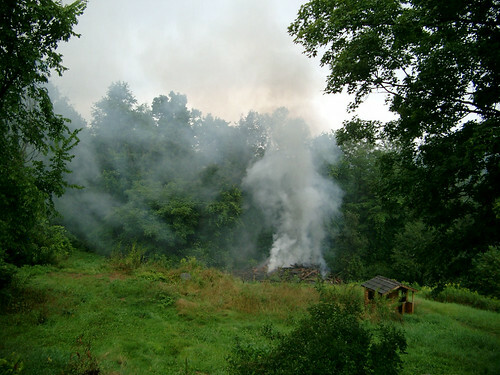 After more than a month-and-a-half of drought and a week of chasing Lee by phone (Lee is the man who helped dismantle the barn and was to burn it, but who doesn’t have a phone and is near impossible to track down), the barn is finally burned on August 21! These photos don’t do it justice. At times, the flames were two-thirds the height of the surrounding trees, but Lee knew what he was doing, and only one branch of a nearby tree burned slightly. Other than that, only the pile itself burned. We could feel the heat from the house. The fire started around 8:30 am. The big flames were gone by noon. We could still see a glow that night. 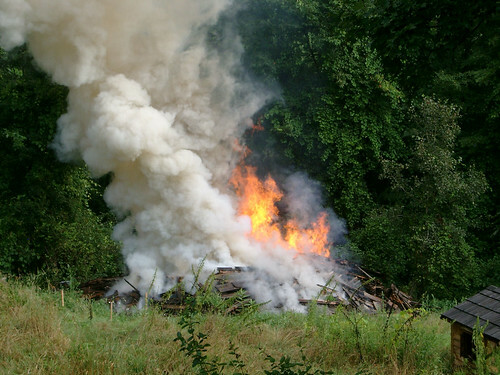 Puffs of smoke drifted out of the pile for several days after.